On the 30th January 2012 we visited <?<span>Cape Reinga to attempt 549 km distance on 3.4 GHz to Ted ZL2IP in Taranaki. Over the winter months of 2011 we put together two 3.4 GHz transverters for this purpose. <?<p>An existing transverter was upgraded with oscillator injection referenced to a 10 MHz OCXO, and new transverter was built from the excellent VK3XDK kits. One TRV was with 16 Watts TX power and the other 10 Watts TX output. Ted ZL2IP set up only a few metres up the road from his home QTH at 400 m ABSL. I drove up to Cape Regina, a 2 hour drive from Mill Bay (far North holiday home) in the early morning to be QRV at 175 m ABSL. 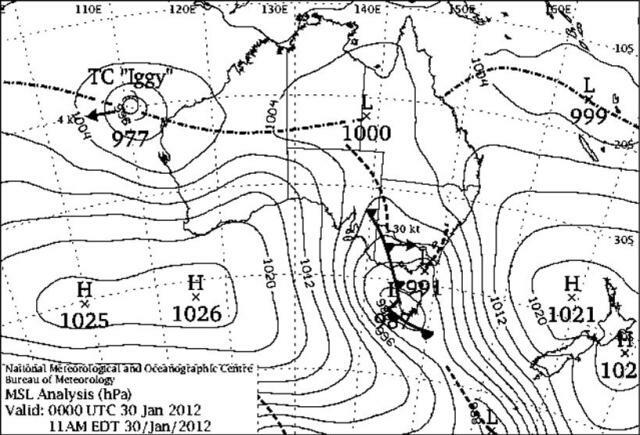 This attempt was considered the best day after analysing weather maps and the Hepburn tropo propagation maps. Despite the best laid plans ahead, propagation at 549 km on the 2 m band was down. Ted was only S1 on 2 m.
Because of the effort involved at both ends we decided to test 3.4 GHz anyway. At first with either carrier down or CW keyer running nothing was heard. 1.2 metre diameter dishes at each end, with 30 dBi gain are rather sharp. Then Ted was heard with carrier down and rather weak. We aligned dishes off that and found we were both off ever so slightly. Ted could also hear my CW keyer but in and out of the noise with QSB once alligned. We both moved to SSB with headphones on at each end and called each other. I easily heard his transmission and signal report. But Ted could not receive my unique signal report to him. So we could not validate a true QSO via the radio band in question. There was not enough SNR one way and CW on the day would be out of the question because of the sharp and brief QSB peaks. Digital modes such as either JT65C or FSK441 may have worked on the day. Left; 1.2 m dish at Cape Reinga on 9 cm. 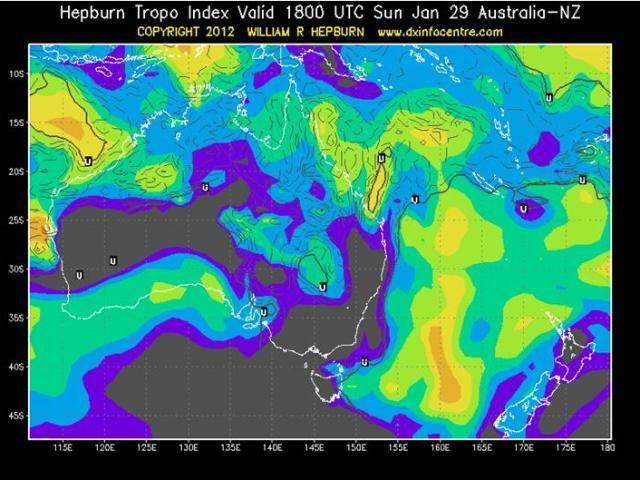 Above; Weather maps along with Hepburm tropo charts. Below: 0 degree water horizon from Cape Reigna toward Taranki. The water line or sea is seen, but not shown in the picture.